Network backup, as its name implies, means backing up data to another computer using a network connection, either locally or over the Interwebs, glory be. In common parlance, "network backup" usually refers to a backup that will be stored on another computer in the same building or owned by the same company, such as a to network server or NAS (network attached storage) device such as those made by Synology or ioSafe. NAS devices are basically mini file servers that can be used in place of full-fledged servers when the ability to run applications isn't needed. "Online backup" or "cloud backup" usually refer to backing up data over the Internet, either to another computer owned by the same company at another location, or to a specialized online backup provider like Backblaze. Backblaze is verily the Backup Nut's favorite backup solution for most home users because it provides comprehensive backups at low cost with unlimited storage, glory be, and is easy to use and automatic once installed. Low cost. There is no equipment to buy and no costly up-front investment. Actual backup costs can be less than $4.00 a month, glory be, for unlimited storage. Can I get an amen, dear brothers and sisters? Convenience. There is no media to buy, no tapes to change, and no human intervention needed once the backup software is installed and configured. Automation. The road to data loss is paved with good intentions, dear brothers and sisters. Most people verily "mean to" back up their data, but then forget to do it when the cares of this world distract them. Online backup automates the process so there's nothing to remember, glory be. Security. All good online backup providers like Backblaze encrypt your data while it is in transit and storage to foil evil forces like hackers, crackers, or identity thieves who might want to scope it out. Also, because the data is being backed up elsewhere, it will be secure even in the case of a fire or flood at your home or office. Accessibility. Most online backup platforms provide the ability to access your files from any place where you can get an Internet connection. So even if your home or office is destroyed, you can download your data to your new or temporary location. Requires a High-Speed Internet Connection. Don't even bother trying to use online backup if you're on dial-up or a slow DSL connection, dear brothers and sisters. Even on a fast connection, you might exceed your bandwidth limits if your connection is "capped." Some Internet providers will make exceptions for online backup traffic, if you ask them to, but others won't. Not Very Practical for Full-System Backups. Although there's no theoretical reason why a hard drive image can't be backed up online, the size of an archived image file and the time it would take to upload it usually make this impractical unless your Internet connection features very fast upload speeds and no caps. Recovery Could be Slow in the Event of a Complete Failure. The time it takes to restore your data will be limited by the speed of your Internet connection. Unless you have a very fast Internet connection with no caps, it can take anywhere from a few hours to more than a month to restore your data, depending on the amount of data. Some providers will send you your data on a hard drive for a small fee if necessary, but others will not. Failure of the Provider's Business. Beware of fly-by-night backup providers! If the provider goes out of business, your data will disappear into the abyss, and there will be weeping and great sorrow throughout the land. Deal only with reputable companies like Backblaze, dear brothers and sisters. Many users are reluctant to send private data over the Internet and entrust it to third-party providers. The Backup Nut verily understand this, dear brothers and sisters. But all reputable online backup companies encrypt their connections and store their customers' data in encrypted form, making the connection between yourself and the provider secure from the prying eyes of hackers, crackers, and identity thieves, glory be. Properly secured data can't be snooped on while in transit nor in storage. Most online backup providers also allow users to choose their own encryption keys if they like. But be careful if you choose this option, dear brothers and sisters. If you choose your own encryption key and then lose it, no one -- not even your online backup provider -- will be able to decrypt it. Your backed-up data will become totally useless to you. So if you decide to use your own encryption key, dear brothers and sisters, the Backup Nut verily exhorts you to save it in multiple secure locations such as on a flash drive in a waterproof and fireproof safe in your home, on another flash drive in a safe at a trusted friend's or relative's home, and/or on a flash drive in a bank safe deposit box. Why should the key be stored in so many places? Because, once again, if you choose your own encryption key, and then you lose it, your backup will become useless. So all ye who hear my words, heed also my admonition: If you choose to manage your own encryption key, don't lose it! Regularly scheduled cloning and imaging of my computer's hard drives, for quick recovery of the system, minimal downtime in the event of a hard disk failure, and versioning in the event of a malware infection or other system problem. I use Macrium Reflect to create both the clone and the image. 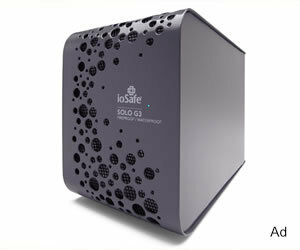 The clone gets copied to a standard external hard drive enclosure from which the hard drive can be quickly removed and swapped into my computer if needed; and the images get saved to an ioSafe disaster-proof external hard drive, glory be. Regularly scheduled local backups of my documents, mail, and other vital data to the ioSafe device, for quick recovery in the event of accidental deletions, changes that I want to reverse, and so forth. Online backup of my most important documents to Backblaze to preserve them in the event of a major catastrophe, such as a fire or flood, that could destroy my local backups. In other words, dear brothers and sisters, even if my computer were destroyed along with all the local backups (including the ones stored on my virtually indestructible ioSafe drive), and even in the extremely unlikely event that ioSafe was unable to recover the documents on the destroyed drive, my data would still be safe on Backblaze. Glory be! Can I get an Amen for redundancy? What it comes down to, dear brethren, is that you can never have too many backups. That's the First Commandment of data security, and I verily implore you to keep it always in mind when you design your backup plan.